A swath of East Coast states was on edge Tuesday as an expected Nor'easter — the second in less than a week — rumbled toward the region, threatening 45 million people with strong winds and up to a foot of snow in some parts. 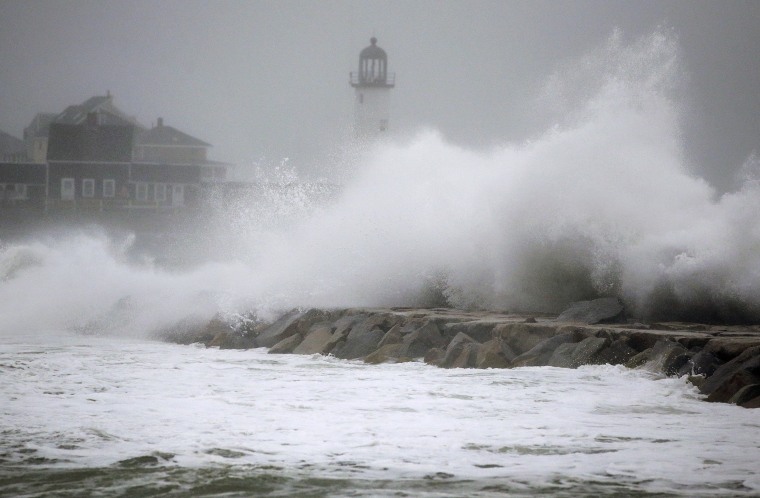 The latest storm, which comes on the heels of a deadly Nor'easter that cut power to tens of thousands of people last week, won't bring the same intense winds and flooding, forecasters said. The system is expected to move fast, peaking Wednesday afternoon through the night before moving out by Thursday morning. Snow was expected to start falling in the New York City area late Tuesday with little accumulation. But by midmorning Wednesday, the Nor'easter will be in full swing, and estimates for the city topped out at 8 to 12 inches, with up to a foot in parts of New Jersey and Connecticut and 6 inches in Boston. The rain-snow line could make exact totals difficult to calculate. If the storm moves southeast, the snowfall totals could rise, forecasters said. By late Wednesday, winds could reach 30 mph to 40 mph, but snowfall will gradually decrease until the storm rolls out early Thursday. 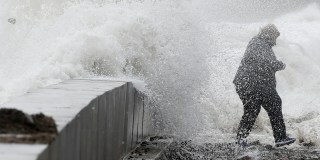 Meanwhile, the storm could threaten more flooding in coastal cities, such as Duxbury, Massachusetts. Crews in the historic seaside town south of Boston were working to prevent a second round of flooding after a seawall collapsed during last week's storm. 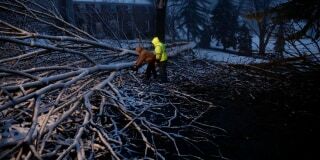 Streets Department workers David Boardly, left, and James Ockimey clear a downed tree during a winter storm on Friday in Marple Township, Pennsylvania. "It's a barrier beach, and if you start losing the seawall, you start losing ground and you start losing houses,” Fire Chief Kevin Nord said. At least 100,000 residents of Massachusetts, Virginia, Pennsylvania, New York, Delaware and Connecticut were still without electricity after the previous Nor'easter, which was linked to the deaths of at least nine people, including a child in New York and another in Virginia who were killed by felled trees. As some in New York faced their fourth day without power, crews raced to resolve the problems before the second storm moved in, said Michael Clendenin, a spokesman for ConEdison. Heavy wet snow could bring down more power lines that have already been weakened. "We've got 400 mutual aid crews out now. We expect even more to come in as the days go on because we know this other storm is coming," Clendenin told "Today." The latest storm aiming for the East Coast created whiteout conditions in parts of the Northern Plains and the Midwest because of the combination of high winds and heavy snow. It was believed to be responsible for the death of a woman in Adair County, Iowa, before dawn Tuesday, according to an Iowa State Patrol accident report. The SUV lost control on a snow-covered highway, over-corrected and struck an oncoming car head-on, according to the report.